Well I was told it was time for an update, so I will track back to last weekend and what has happened since then....hmmm....not too much. Last Friday night Clint and I caught up with one of his mates from Aus, Hack, who is over here holidaying. We went to a couple of places and all got very happy, me especially who made a few trips to the toilet that night and the next morning, very sore head the next day!!!!! Heres a couple of pictures from the night. 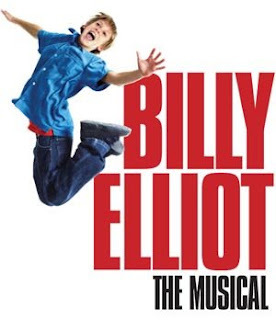 On Saturday (my birthday) Clint took me to see 'Billy Elliot' on the West End. Both of us were not sure what it would be like but agreed that it was fantastic and the main character in it, the young boy, was just amazing. The week at work went quite quickly. I was at the same school all week doing Planning Cover for the teachers, which basically means I could be in 3 different classrooms in one day. It is good as I get to know all the teachers, as well as the kids, the days go quickly and I do not have to plan. I am there next week too and if all goes well I will be there until the end of the school year in July! So thats good news. Clint is at a new site at the moment where he has to lay flooring. He is finding it ok, he can walk there now which is good too, rather than having to catch public transport. He is not impressed with the Health and Safety standards and at one stage there was live wires they were told to just 'work around' which they didnt of course. Easter weekend break has started, yeah!!! A 4 day long weekend for us.....so far we have done one thing.......go to a highly recommended place......Gourmet Burger Kitchen, thanks Warren (your two favourite UK things - Gourmet Burger and Wine Gums) !! Wow, this place was amazing. You need to have a good budget for this $14 AUD per burger, but if you check out the photos you can see why!!!!! Plans for the rest of the weekend......thinking of doing some tourist-y stuff this weekend.......gonna see how we go, it will be quite busy being Easter Weekend. Chatted to Mum, Perty, Mandy and Jo, and Margie today, which was lovely. And great to hear some voices from home. If anyone has Skype, please let us know, as we would love to chat to people from home and it costs basically nothing!!!! I'll leave by adding a few older photos from last weekend, that blogger wouldnt let me upload then. Oh I forgot to add, some of you may know, we have a pub right across the road from where we are living. Its nice and has good Happy Hour deals. Anyway, Tuesday we come home from work to see film crews and vans everywhere infront of the pub and our house block. Guess who was filming their new film there?? 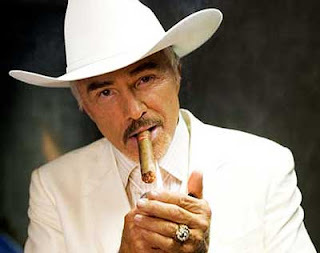 It was..... Burt 'The Bandit' Reynolds!!!! It was a pity we could not take photos!!! But it was cool to have our first encounter with fame here!!!! One more exciting piece of news that has made my year!! 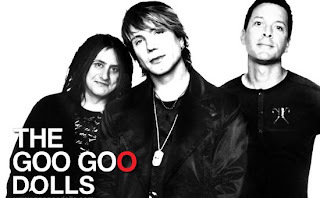 Well close to it anyway.....my fave band ......The Goo Goo Dolls are touring here in July!!!!!!! I am so pumped...we (much to Clints distaste) will be seeing them twice. Once at a music festival, and then again at a concert on their own in Liverpool. we are going to make a weekend out of the gig in Liverpool and do the Beatles touristy stuff whilst there. And to top all that off there are two major scrapbooking events coming to London in the next month! All is going well here...!!! Okies, thats all for now! dear raquel & clinton, glad to see you are both well &having a good time. i'm very jealous of you seeing billy elliott. All is well here.take care of yourselves love aunty rhonda & fam. OMG Raquel - YOU LOOK SO HAPPY!!! WOW what a fantastic place you are living in and what great PHOTOS!!! Glad everything is working out well for you over there! TAKE CARE LOVE YOU!! !